Rely on us to buy the best in class Electrical Control Panels; we are a notable Supplier in this domain. In order to deliver qualitative lot of products, we have hired a team of quality examiners who strictly check the product quality at several stages. All above items (A & B) are used in manufacturing in following control panel. 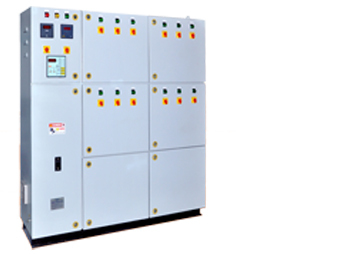 So, we can supply control panels (power distribution, MCC, PLC, Power factor correction plan etc…) as per logic of customer and it’s spare as mentioned above. All reputed make PLC & Relay logic type MCC with all type of IP (IP 42, IP 55, IP 65, ) protection. Also, we can supply Cable tray, Transformer, All types of Limit switches, Linear and Rotary, Servo controlled stabilizer, controller (Voltage, Current, Frequency, Power Factor), Ultra Isolation transformer, All panels are made as per customer design, so selection of individual components as per load data of electrical items or as suggested by customer. All above are related to electrical items. Now, we can supply in following mechanical products also.